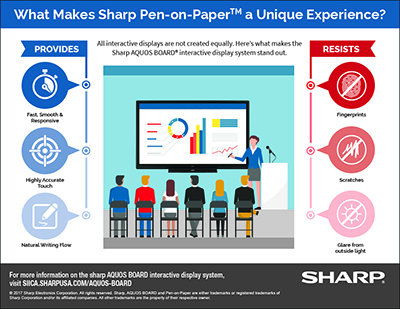 What makes the Sharp Pen-on-Paper experience in Sharp AQUOS BOARD® interactive display systems stand out from the competition? Here are five advantages that you won’t see on a spec sheet. Fingerprint proof: The sight of oily fingerprints all over the screen makes for an unattractive and unpleasant user experience. We invite you to run your hands all over the screen of an AQUOS BOARD interactive display. There will be no unsightly fingerprints left behind! Sharp’s proprietary coating masks the appearance of fingerprints and is resistant to skin oil, creating a superior looking user experience. Glare resistant: Bright rooms help facilitate a lively exchange of ideas, but can be disruptive when the sunlight or overhead lighting creates on-screen glare. Sharp’s proprietary anti-glare coating eliminates the disruptive glare while still providing a bright, easy-to-view user experience. Natural writing flow: Not all writing surfaces are created equally. Writing on a flat panel display needn’t feel slippery like you’re sliding around uncontrollably on glass. The combination of Sharp’s proprietary glass coating and the AQUOS BOARD interactive display’s pen tip material produces a natural writing feel—like pen on paper! Highly Accurate Touch: Not all touch screens perform the same. There can be noticeable differences between the actual touch point and where the digital ink appears. It’s known as “parallax error.” Sharp’s integrated touch technology is specifically engineered and manufactured for high accuracy and longevity. Fast, smooth & responsive: Not all touch screens are able to keep up with today’s fast paced handwriting and drawings. Sharp’s integrated touch technology is specially designed to keep up with the way you write and draw… no skips, stutters or delays. The result is a fast, smooth and responsive digital inking experience. There’s a reason why we’ve named it the Pen-on-Paper experience. Drawing or writing on the AQUOS BOARD interactive display—whether using the Sharp Pen or your finger—is just as natural and accurate as if drawing with an ink pen on a piece of paper.